There really isn’t much to write about as I’ve told you most everything on the phone. By the way, when you receive your bill for the month let me know just how much these calls cost. I heard from Harley yesterday and it seems that he wants something to do and they just won’t give him anything. They have now made him landscape sergeant and I can just see him pulling weeds and taking care of flowers. If he should ever get his load on, he’ll nip out the flowers and let the weeds alone. I haven’t written to Woods yet, but give me time. I’ll get around to it before long. We have to police up the area now, so will leave you for a while. Be back before long. — Hello again. We no sooner pick up the old cigarette butts and paper than some jerk behind you drops one so that cleaning up is getting to be a problem. Policing up is what is known as body bending exercise, head down, backsides pointing to the sky. Smitty was unable to tell his mother that he and the 11th A/B would be shipping out the following day – destination and mission unknown. The men cruised from Suisan Bay into San Pablo Bay, into San Francisco Bay and under the Oakland Bridge to Oakland Mole where the Red Cross passed out coffee and donuts while they boarded the transport ships. So … back under the Oakland Bridge, thru San Francisco Bay and under the Golden Gate Bridge to the open Pacific. This photograph on the left was removed from a New York newspaper. 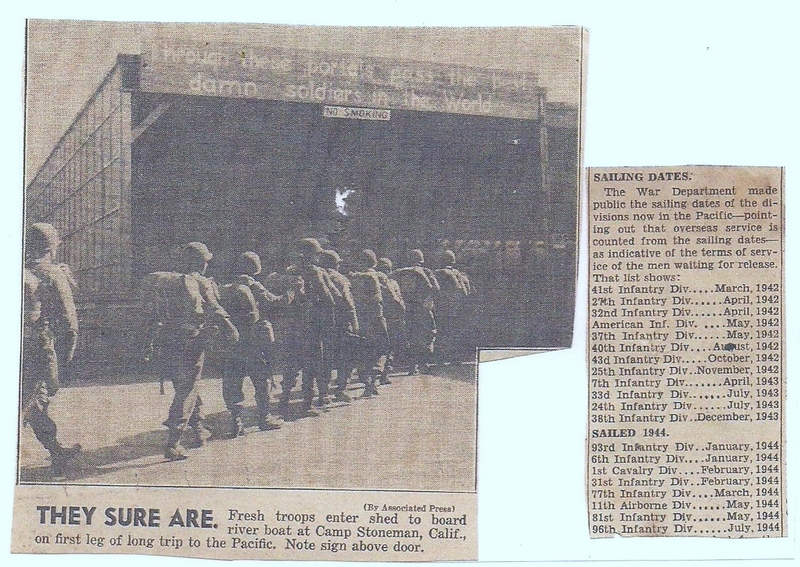 The sign above the entry states: “Through these portals pass the best damn soldiers in the World.” The clipping beside it indicates shipping out dates. The 11th A/B departed May 5, 1944. Smitty said that this cruise would be the most boring part of his service, although he did become quite adept at playing cards during this time. 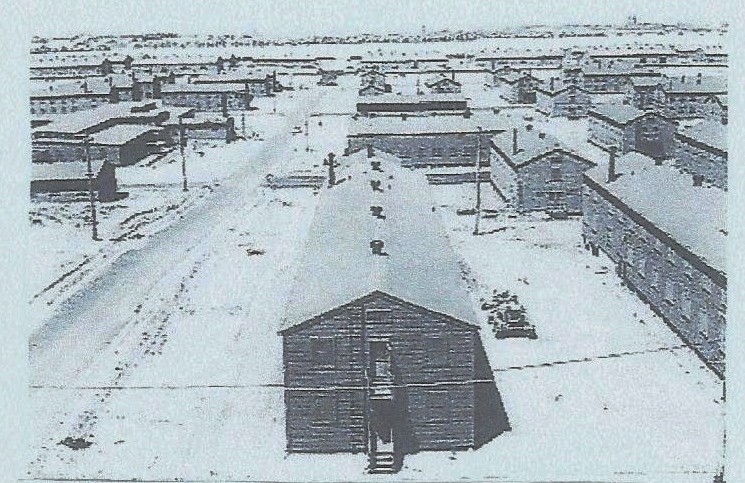 Posted on October 8, 2012, in Letters home, SMITTY, Uncategorized, WWII and tagged 11th A/B, Camp Stoneman, Everett Smith, Pacific War, WWII. Bookmark the permalink. 4 Comments. GP… Oddly, my mother, my sister, and I went through Camp Stoneman in 1953 on the way to join dad at Clark AFB in the Philippines. I think that is logical, Tom. Dad was headed for New Guinea – though he didn’t know it. Those old letters were a pleasure to read even though the topics allowed were limited. Thanks for sharing! I know my father wasn’t about to describe the war to his mother, and the letters were being censored, so dad improvised.